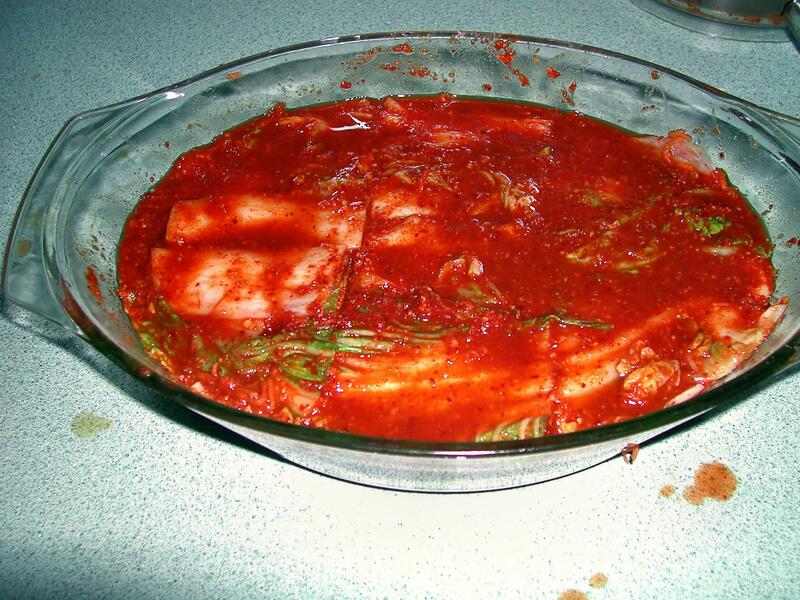 In 1997 and 1998 I spent some time in Korea and got to like their kimchi, a kind of pickled cabbage, not unlike European sauerkraut (or choucroute). Outside of Korea it's not easy to get hold of, and the stuff I found in Adelaide was both very expensive and not very authentic. I think they put vinegar in it, which is absolutely wrong. I found a number of recipes on the web, many of them contradictory or simplified to a point where it was no longer the same dish. The kimchi I knew in Korea was very peppery. After some experimentation and ten years of refinement, I came to the following recipe, which I make frequently. It takes about at least a week to be ready, most of which is spent maturing in the fridge. The work itself is about 10 minutes at the beginning and 20 minutes at the end of the salting period. This recipe has been put together based on a number of recipes I've found in various places. To me it tastes authentic; but I'm not Korean and have had only limited exposure to Korean culture. 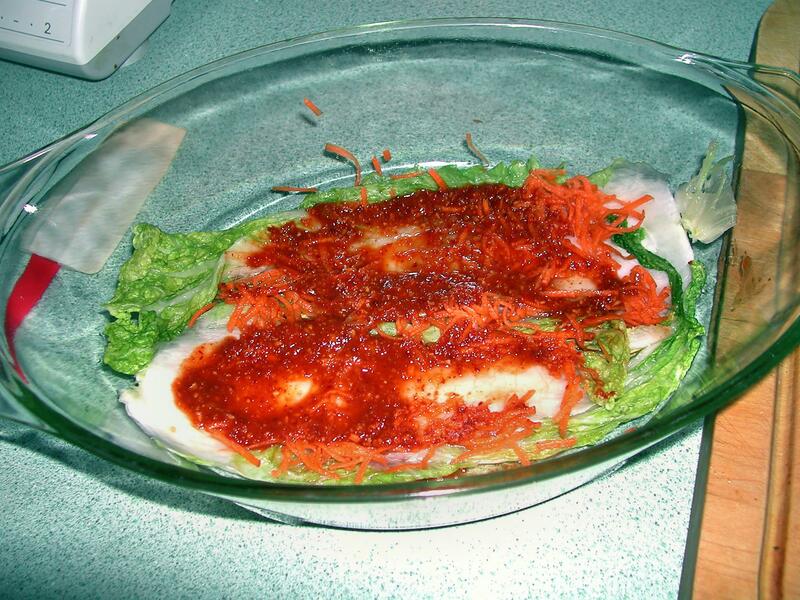 In addition, Kimchi is one of those dishes which is very subject to individual and geographic variations. If you have any feedback on these issues, I'd be happy to hear from you. The step 3 ingredients are based on total weight of 2.4 kg of cabbage and the step 2 ingredients. Adjust accordingly. 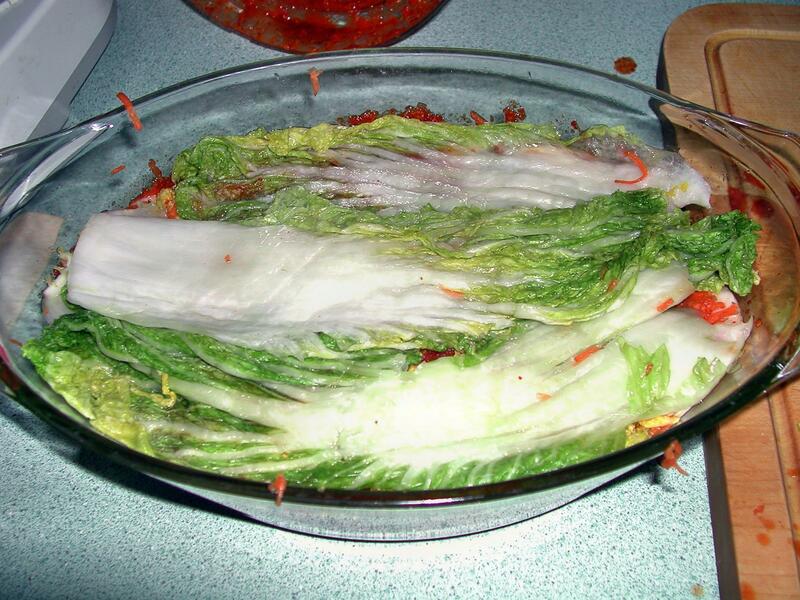 Chinese cabbage has a number of alternative names: in the USA, it's called Napa (Nappa) cabbage, in Korea it's called baechu, and Australian bureaucrats, not to be outdone, have invented the fantasy name wombok, just close enough to Cantonese wong bok to be confusing. I'm not sure how important the choice of chili and fish sauce is. 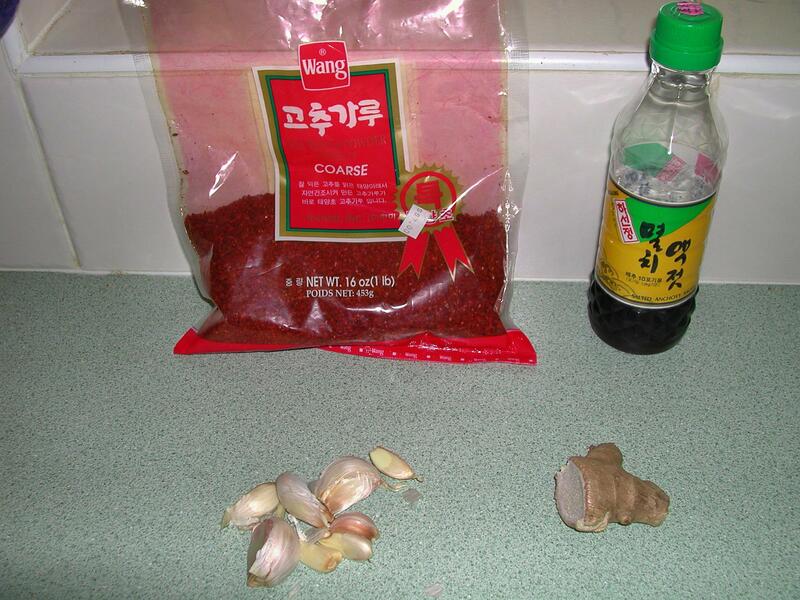 I use coarse chili flakes from a Korean grocer. You can probably use fine chili powder as well, but it's difficult to guess how strong it will be in comparison. I've also tried Vietnamese fish sauce. In the past I recalled that it's not the same as the Korean fish sauce I use, but I've tried it again with good results. Giant radishes are white and carrot-shaped, about 25 cm long and 8 cm across at the top. The are often sold under the name Daikon or Chinese radish. They're well-known in Europe as well. In Germany, they're called Radi. Both giant radish and spring onions are traditionally used to modify the flavour; particularly the onions do this quite strongly. The radish adds a crunchy texture, but I can't detect much difference in flavour. You'll need at least one large bowl for salting and marinating. The best containers are stoneware or glass. For salting, I use cast iron oval goose cooker, about 45 cm x 30 cm. This is OK as long as the enamel is in good condition; salt attacks the iron. There's no reason to believe that a little iron in the kimchi will do any harm, but it might discolour it, and it certainly doesn't do the pot any good. For marinating I use an oval glass bowl, about 30 cm x 15 cm. That's about the smallest you can get away with; something a little larger would be better. I've heard claims that salt with “iodide” will discolour the kimchi. I don't have any experience of this, though it would surprise me, but in my part of the world iodized salt contains potassium iodate, since sodium and potassium iodides are deliquescent and would thus make the salt moist. Iodides and iodates have very different chemical properties; I don't know how this would affect any discolouring. I use coarse non-iodized salt because it's cheaper. Soak in salty water (“brine”) for a relatively short period of time, about one day. 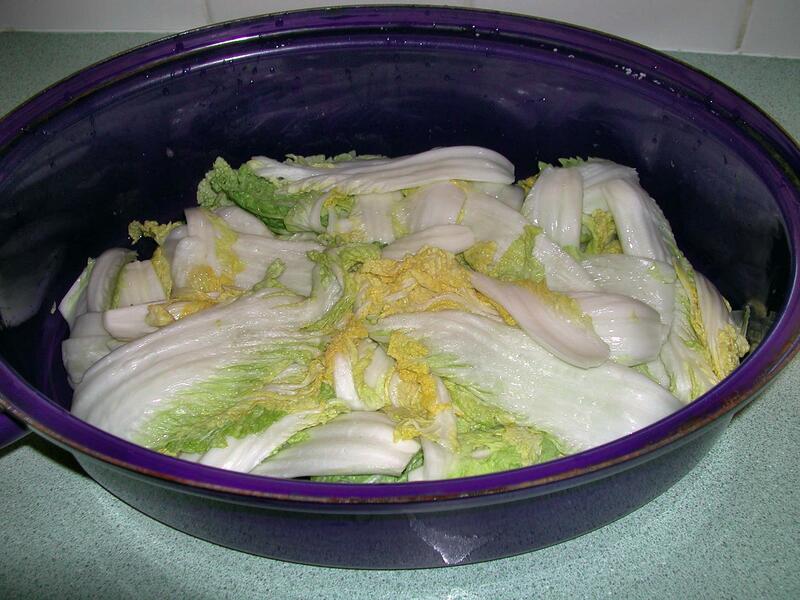 This has the advantage that the cabbage doesn't need rinsing afterwards. Salt with dry salt for several days. This is the approach that I describe in detail below. It uses a lot of salt. For the quantities in the recipe above, you would need about 500 g salt. It takes several days to work. The wet approach is faster. I have modified the time, however; previously I recommended salting for 5 to 7 days. Now it seems that it's sufficient to wait until the cabbage has softened, which can happen within 2 days. It's more difficult to get the right amount of saltiness in the cabbage. I've had cases where it's been far too salty, and others where it hasn't been salty enough. I'm now using first method. The problem was getting the right balance in the saltiness, which appears to be about 5% salt in the water. The temperature is also an issue: it should be at comfortable “room temperature” in temperate climates, round 18° to 23°. If it gets much above this temperature, other organisms can get involved, to the detriment of the taste. Select a relatively light-coloured cabbage, making sure that there is no mould on the visible leaves. Remove about six of the outer leaves, taking care to keep them in one piece, then cut the rest of the cabbage vertically into six segments. Remove the root and separate the leaves. You'll need a lot of space for this. Discard the root. Dissolve the salt in the water in a big pot and put the cabbage leaves in. Turn from time to time, and leave in the brine until the leaves are soft. 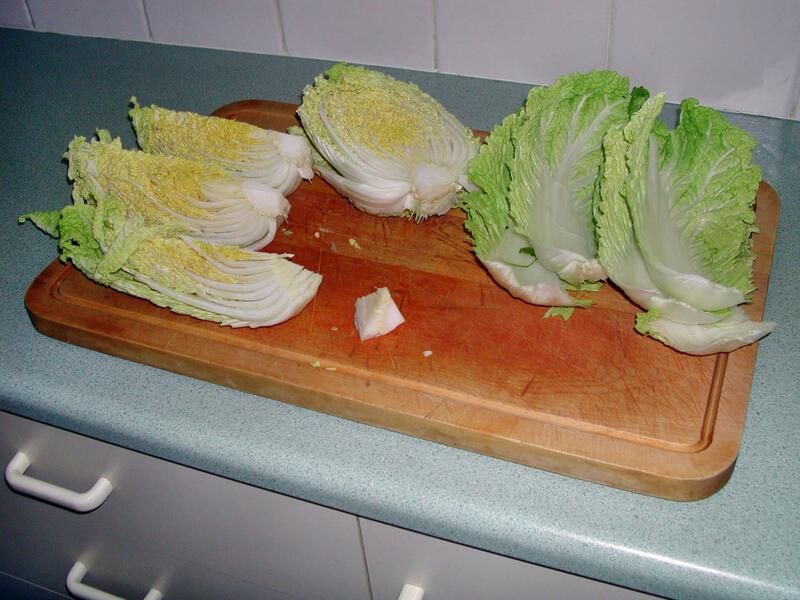 If the cabbage is very moist, leave it on a board to dry for up to a couple of hours. It's not clear that this is necessary. If you don't do so, you still have a salting process that is a lot dryer than the “brine” alternative discussed above. 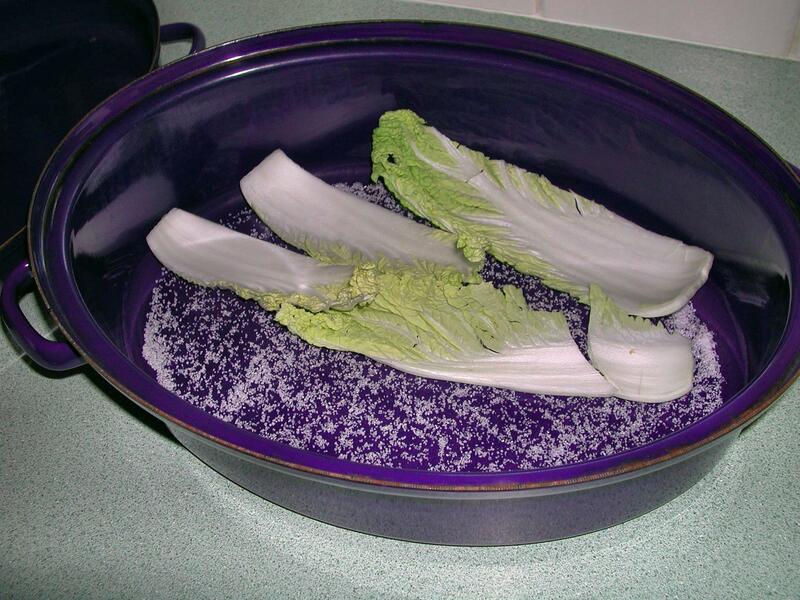 And leaving the cabbage moist means that the salt can get working faster. Then place some of the salt in a large container and place enough leaves on top to roughly cover. Sprinkle more salt on top of these leaves, and repeat until all the leaves are in the pot, finishing off with the whole outer leaves. Place a weight on top and put the pot somewhere where the temperature is not (much) more than 20° (68° F). Wait a day or so. A lot of salty water should have gathered. Turn the contents over, so that the outer leaves are on the bottom and all the leaves are wet. You may need to repeat this operation, which is intended to stop the leaves going brown. 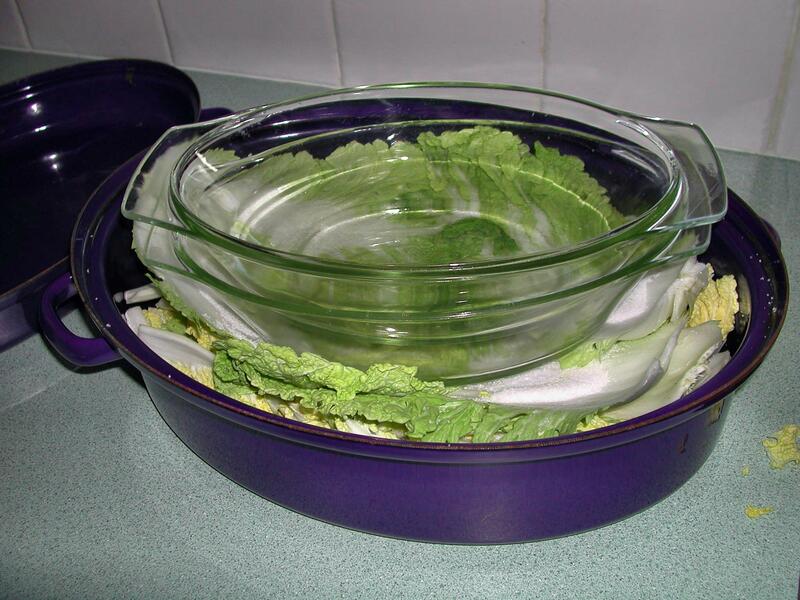 After a couple of days, when the cabbage is thoroughly limp, rinse it thoroughly in fresh water. Soak, changing the water two or three times, until the cabbage is no longer overly salty, usually about 12 to 18 hours. 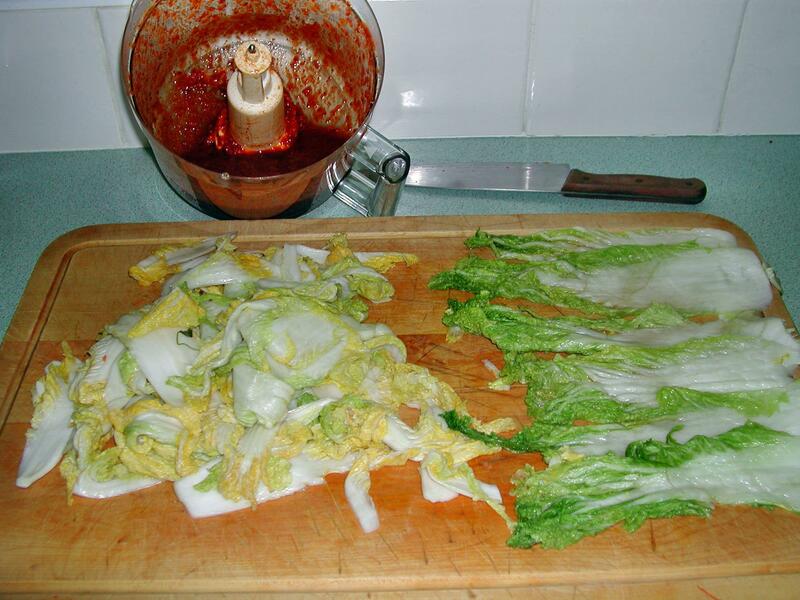 The quality of the finished kimchi depends a lot on this step, and the length of time depends on the thickness of the cabbage leaves, which varies a lot—as mentioned, this is the biggest disadvantage of this approach. To check progress, cut a slice off the bottom of one of the thickest leaves and taste it. It should taste as salty as you want the finished product to be. I've had reports that rinsing the cabbage will stop the fermentation. This is demonstrably not the case. Put the water, chili, garlic, ginger and fish sauce into a blender and puree. Leave for half an hour for the chili flakes to swell. The resultant liquid should be about as thick as meat gravy. Spread some of the marinade on the bottom of the marinating bowl, then cover with some of the outside leaves you peeled off at the beginning. Spread some more marinade, and also some radish or spring onion if you choose. The photo shows carrot, which was an experiment that I won't repeat. Repeat until you have used up all ingredients, finishing with the rest of the outside leaves. The purpose of putting the outside leaves on the outside is to make the entire package easier to handle. Make sure you have some marinade left to put on top, but don't put it there yet. Press down on the package to squeeze out any superfluous marinade, pouring it back into the blender. When the package is relatively dry, remove it en masse from the bowl and place on a wooden chopping board. With a large knife, cut it into about six pieces. In the bowl I use, I make one cut along the long axis and two cuts across. Carefully replace the pieces, then cover with the reserved marinade. Put in the fridge for a week, after which it will be ready to eat, though it will continue to improve for a couple of weeks. In Korea, kimchi is buried in the ground in stoneware pots. I have heard reports of Koreans in the USA who use special fridges just for kimchi, though I need to be convinced of such a necessity. 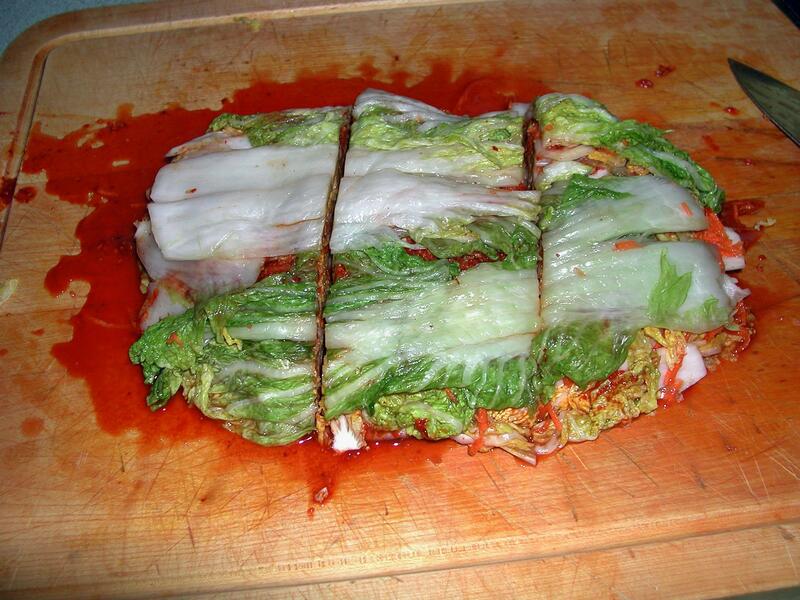 Make sure there is enough marinade to cover the cabbage, otherwise it is liable to go mouldy. Via Wikipedia I found a semi-official Kimichi site which includes a recipe. Unfortunately the domain seems to have gone away, so currently the links above will fail. I'm leaving them there in case it comes back again. The recipe is certainly interesting, and it's reasonable to believe that it's completely authentic, but again I'm left wondering how typical it is. It uses pickled anchovies and raw oysters, for example, things that I've seen in no other recipe, nor in any Kimchi that I have ever eaten. Again, I'd be interested in feedback. WikiBooks has a recipe. It's quite similar to mine. It also uses carrots, which I have decided are a bad idea, and sugar, which I'm sure I wouldn't like. Jack Roehrig, who sent me some of the comments above, has at his own recipe. You will recognize some of the points I discuss.